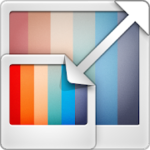 Resize your photos easily with 'Resize Me!' before sending them by email or share them on Twitter, Facebook, Instagram You can do it with a single click or use the interface to rotate, crop and resize. - Share or save the result.